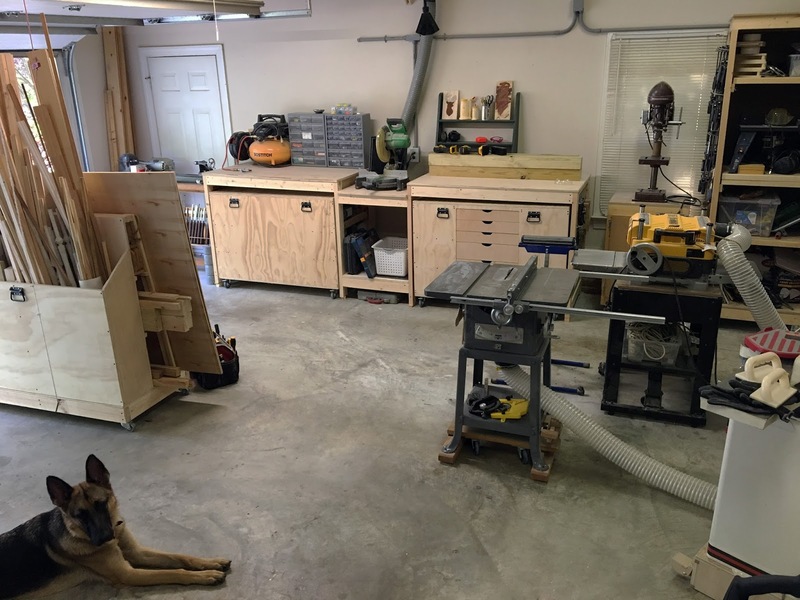 If you saw my previous post you’d know I got a jumpstart to getting my shop in order. I’m feeling really good about how clean it is (like open the door to the garage just to peek in kind of good). I thought now would be a great time to take you for a tour and talk about tools and stuff. You know – the good stuff. 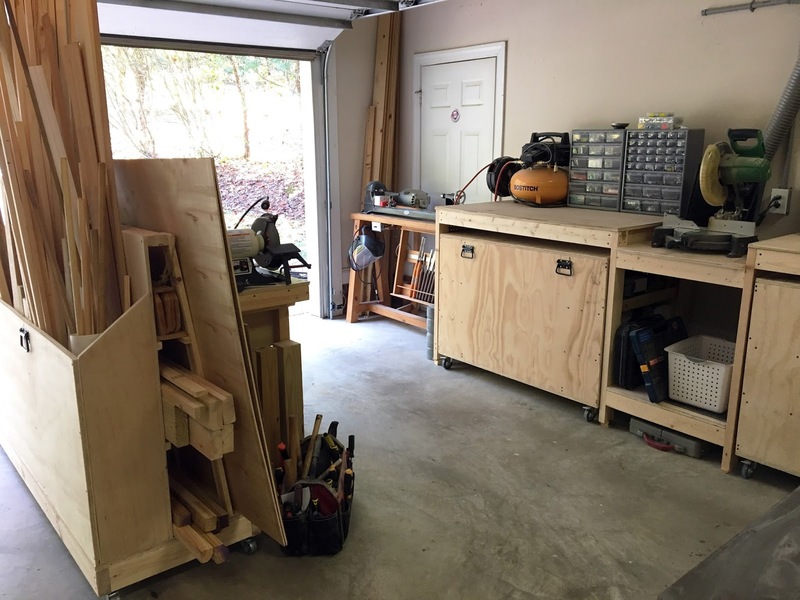 We have a 2 car garage and this is my side – my retreat! I’m going to try and stay on my side and not move projects passed my new lumber cart there on the boundary – ha! If you want to see the post for the lumber cart – click here. 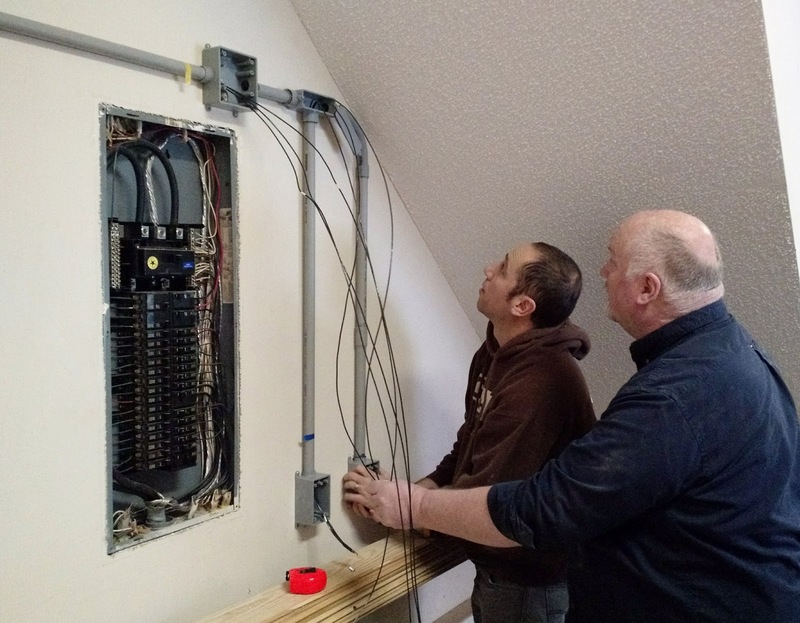 Do you see the gray conduit on the walls? Having more outlets was one of the best additions I could have asked for last year – I’ll talk about that later. This is the business corner of my shop. I love my big tools and can’t believe they are MINE! 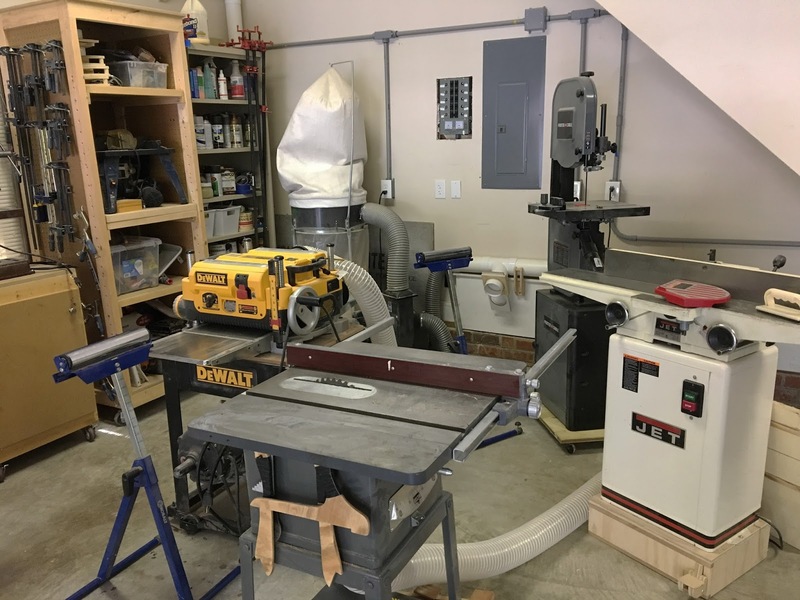 I got the DeWalt Planer and Jet Jointer for sale off Craigslist for $900 (read about that adventure here if you’d like). I got the Porter Cable bandsaw off Craigslist a little later for $350. 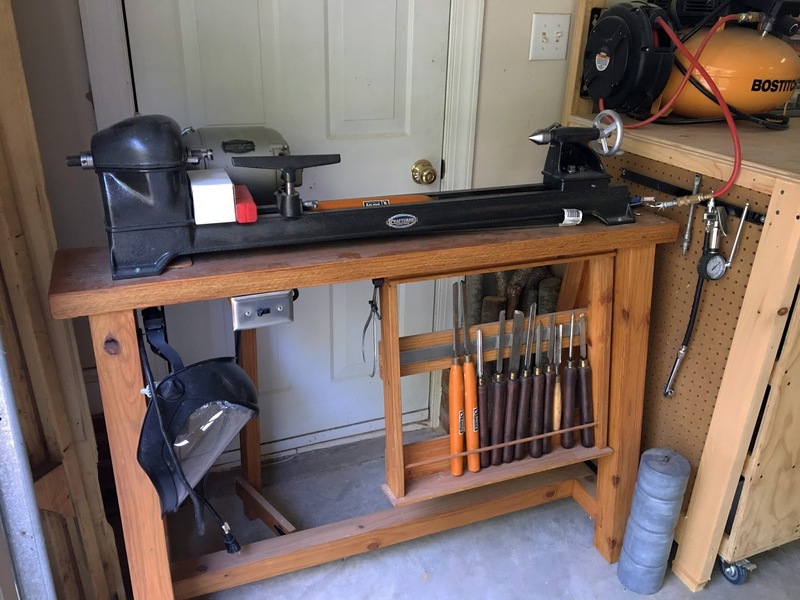 The old Delta table saw was $100 that I asked my husband to get me for my birthday (read about that restoration, here). 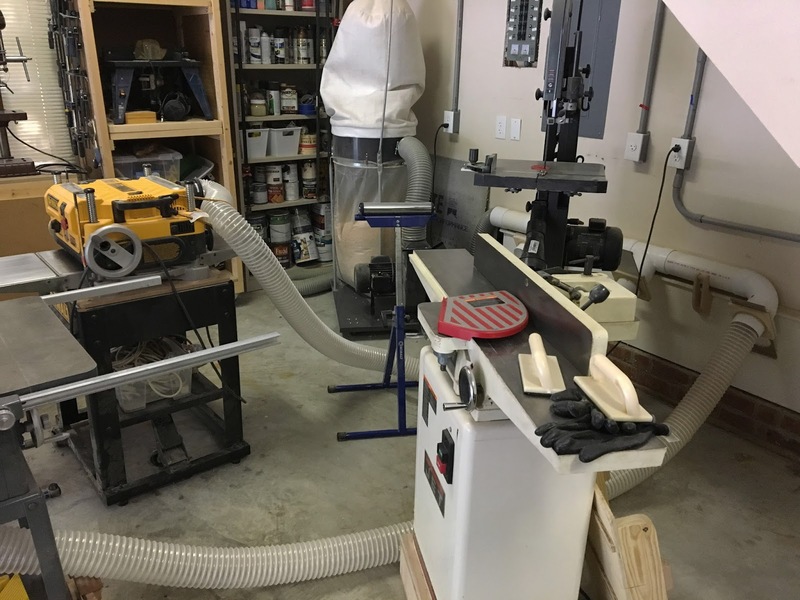 The dust collector was a Mother’s Day gift from my husband that I was so grateful for – I finally got it routed to my tools a few months ago and will talk about that later. 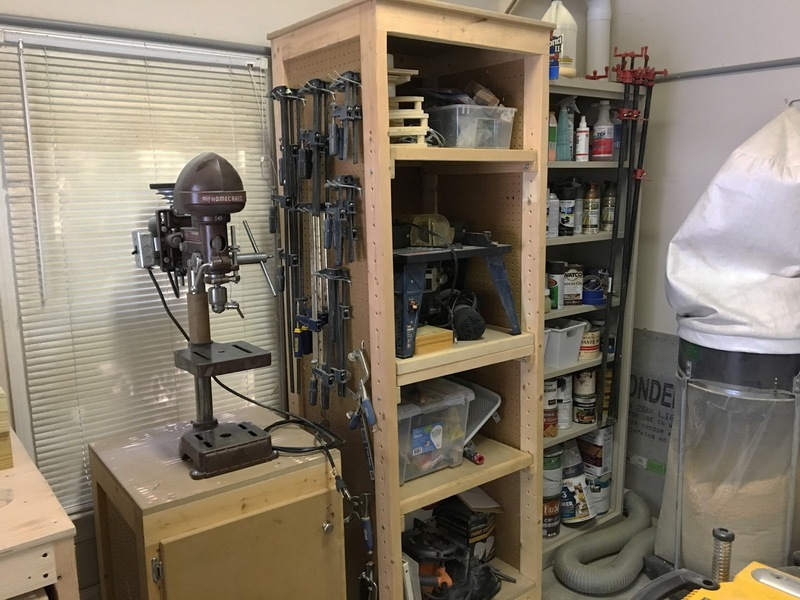 The tall wooden cabinet and rolling cart my drill press is sitting on was one of the first shop equipment builds I did when we lived in our small student apartment (read about that, here). 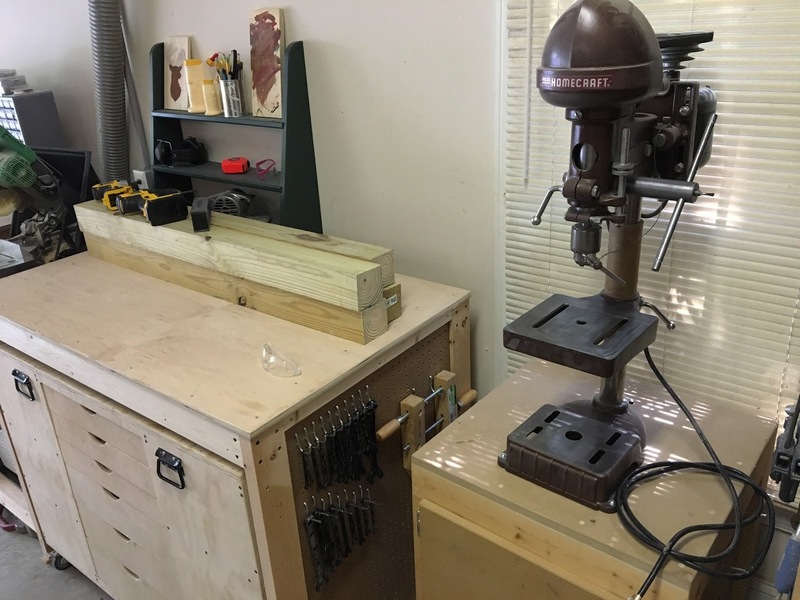 The Homecraft Drill Press was one of the best Craigslist finds for $50 (read about that restoration, here). …and I love that I can pull them out when I need more work space and push them back when I’m not using them. I can’t thank Ana White enough for the design! Click here to see that build and have a little peak at how much my shop has changed since then (Eek)! This old Craftsman lathe was another Craigslist find. I think I paid $80 for it. See the restoration and table build process, here. One of the best purchases – a hose reel for my new air compressor! 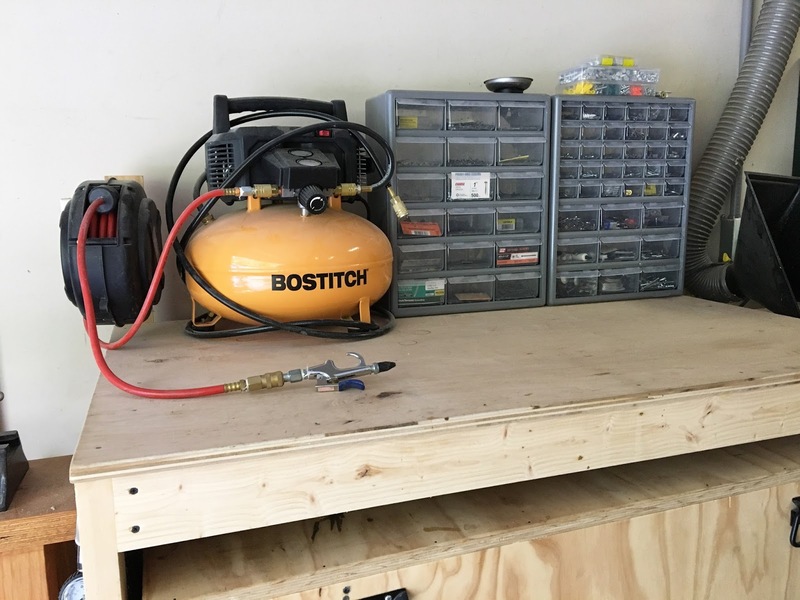 I use this set-up several times a day – quite surprising how useful a compressor is in the shop! I just finished organizing all my screws/nails/knick knacks into these bins and it feels so good to be able to find what I’m looking for – cuts down on a lot of clutter from small hardware boxes everywhere. Ok – dust collector. 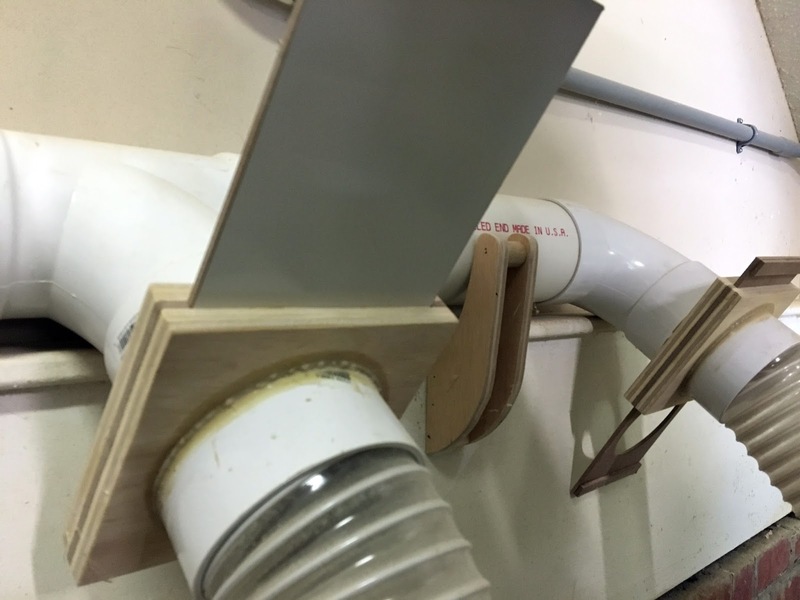 I didn’t want to spend very much money so I went with “doing-it-yourself” by following ‘Jay Bates’ design for dust ports and pipe brackets. After I built them they sat around for over a month while I stewed over the best way to route the dust collector to my tools. 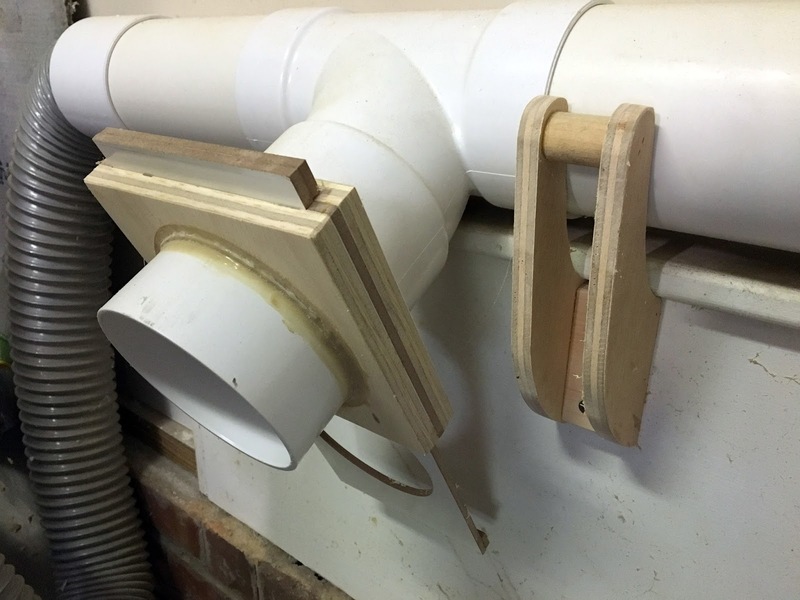 I got really frustrated with the different hose sizes and fittings between what Woodcraft, Rockler and Harbor freight sells along with the drainage pipe I wanted to use. 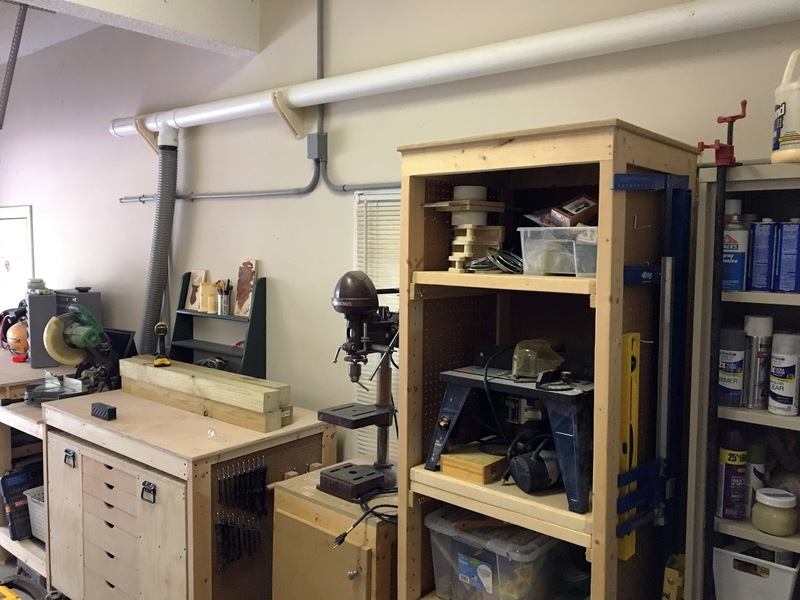 My husband helped me decide that putting the pipe along the back ledge in our garage was a good spot – off the floor but perfectly accessible for opening/closing the ports. 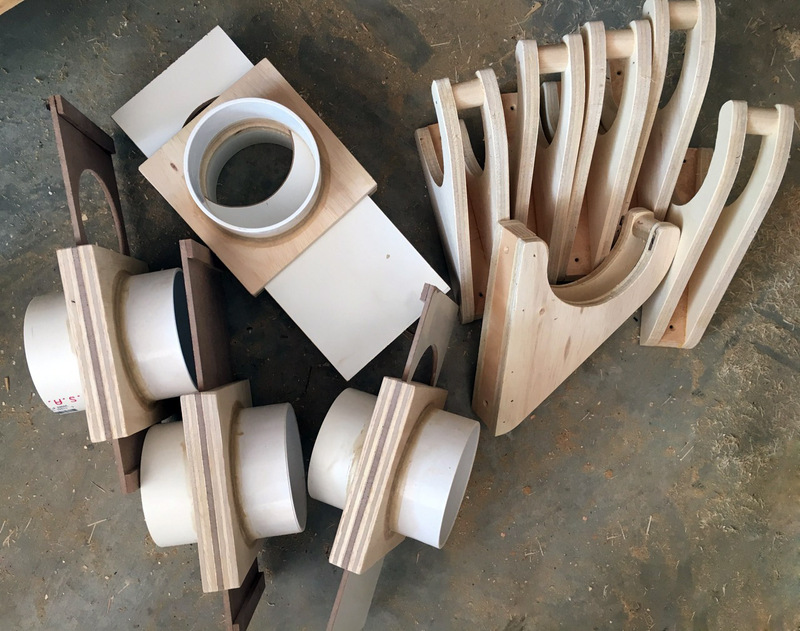 Ideally, I’d have a hose to each tool but for now I have a permanent one to the planer and miter saw and I switch one between the table saw, jointer and band saw. I bought 2 clear hoses from Harbor Freight – they’re a tight fit into the pipe on the dust ports and are pretty secure. Back to the conduit on the walls. 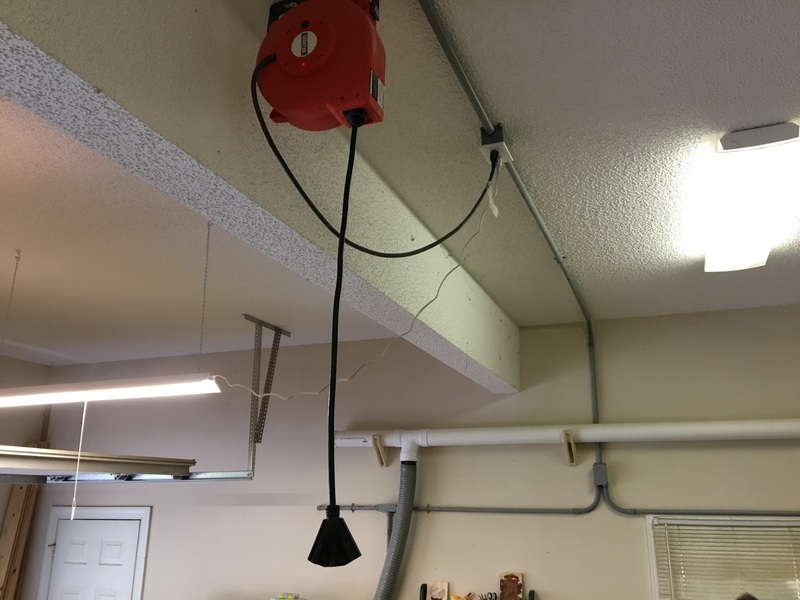 I couldn’t believe we only had 2 outlets in the garage. While my dad was in town visiting during Christmas I asked him how hard it would be to add more. We decided surface mounting the wires was ideal so we headed to get our supplies. My dad and husband at work! They spoil me! They added 4 outlets + a 220v on the walls and 2 outlets on the ceiling for cord reels (I use my cord real more than anything, actually)! 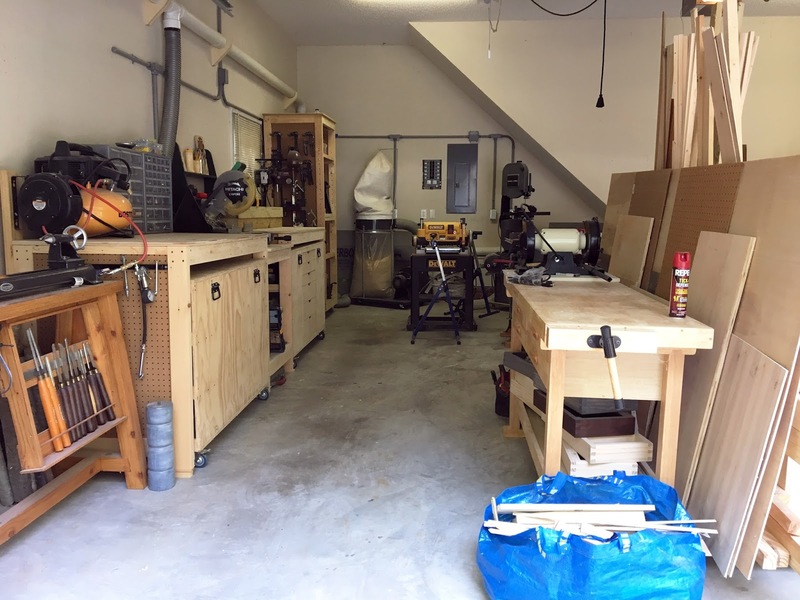 I feel incredibly lucky to have my own little space – truly a dream of mine! 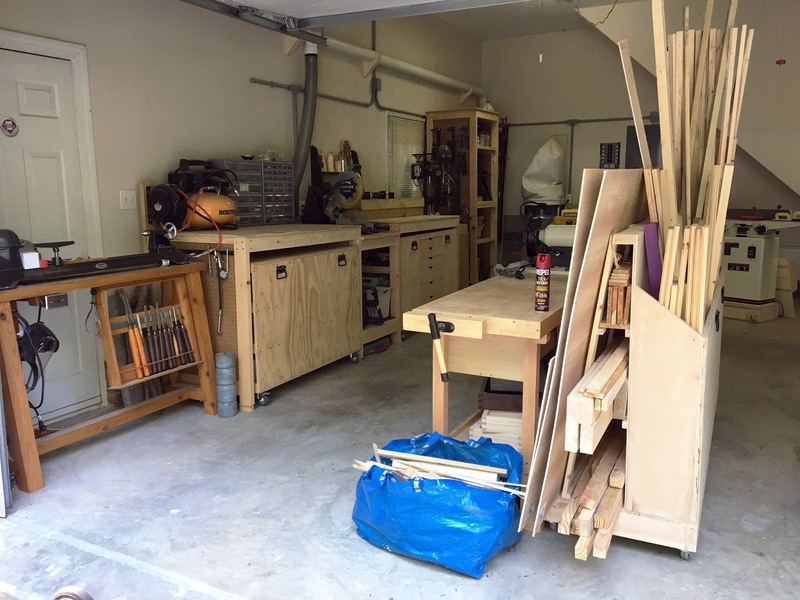 Thank you for taking a tour of my workshop! Hanging Chalkboard – Make Your Own! Thank you for showing us round your workshop, it looks wonderful. I thought I had a lot of tools until just now, (no workshop though). My last woodwork project was done in the kitchen and sitting room :), (and then I had a lot of dust to clear up!) but your facilities/tools are mindblwingly good! 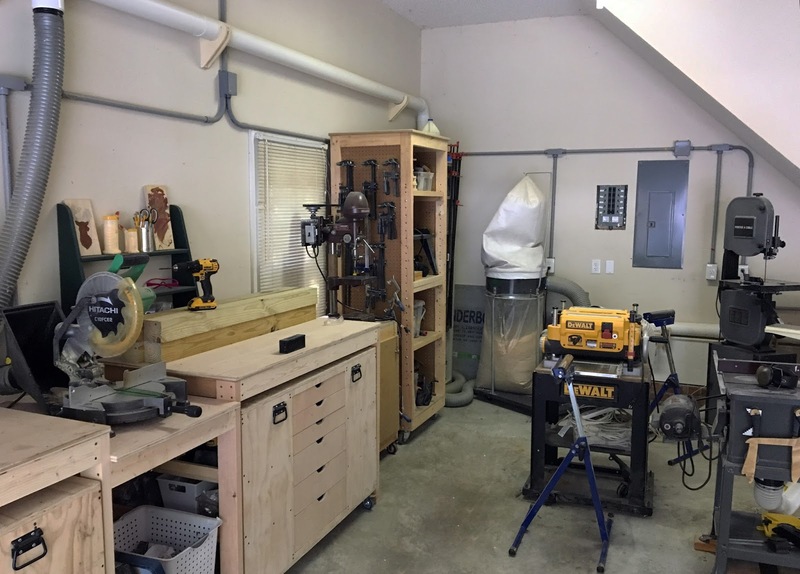 I love your workshop and how you have both old and new tools here. Similar to mine, actually. Your Walker turner lathe restoration is an inspiration to me, as I am about to restore an Oliver 159. 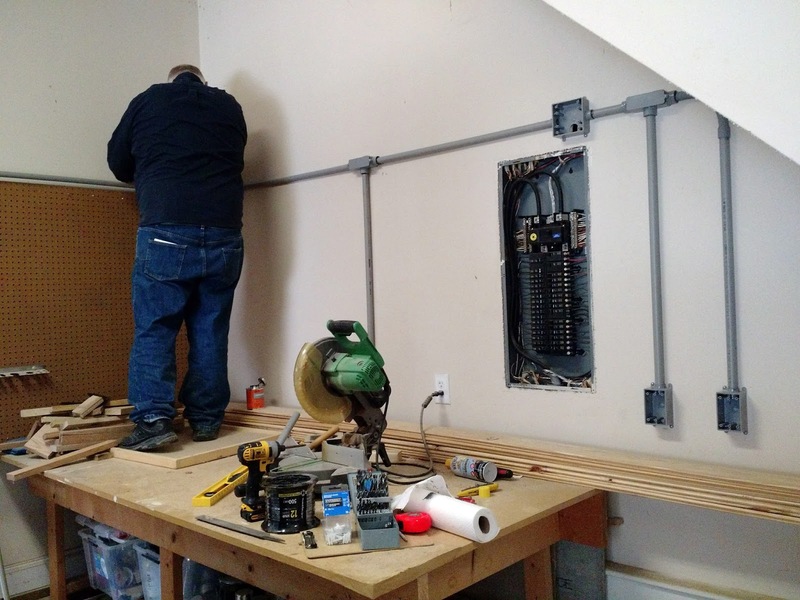 …as a professional state licensed master electrician myself I fully like your wonderful conduit work also…very impressive! Glad you stopped by! Older tools are way cooler than new ones.. but at least new ones come ready out of the box 🙂 I hope your restoration goes well! I’m lucky to have a dad who knows how to do just about anything!